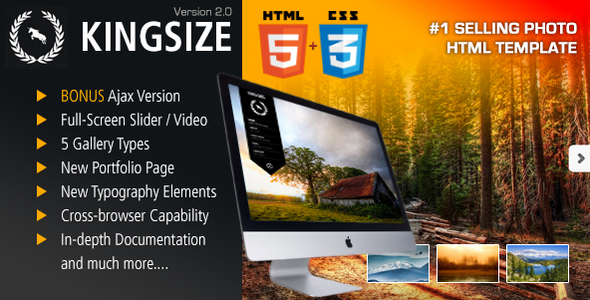 KingSize (HTML) is a great portfolio / photography template that offers full screen background images (slider) and videos. As well as 5 unique gallery styles to impress your visitors! Minimal maintenance as this is an HTML version, it’s all about editing the files directly and uploading to your hosting environment once ready and you can go live with style in mind! Great for smaller based websites, the AJAX version gives a ONE-PAGE look and feel when visiting your website; utilizing the use of back buttons and page bookmarking.